Home > Shopping Store > Fruit Salsa Shopping Cart > Hawaiian Pineapple-17 oz. 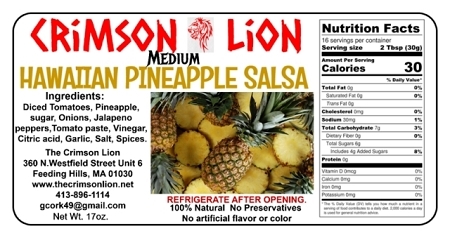 Our Hawaiian Pineapple is a favorite used on fish or ham steak. We use on our Tilapia. Tortilla chips taste great as well just dipping. What's not to like as you have fresh pineapple mixed in with diced tomatoes, onions, peppers. This flavor is not only delicious but very healthy for you. This flavor is always in demand so we must continually increase our inventory to maintain an adequate supply.